Your tax return may show that you’re due a refund from the IRS. However, if you owe a federal tax debt from a prior tax year, or a debt to another federal agency, or certain debts under state law, the IRS may keep (offset) some or all of your refund to pay that debt. Internal Revenue Code IRC (§) 6402(a), (c), (d), (e), and (f) require a taxpayer’s overpayment to be applied to any outstanding Federal tax debt, child support, Treasury Offset Program (TOP) debt, State income tax obligation, or Unemployment Compensation prior to crediting the overpayment to a future tax or issuing a refund. This application of a tax overpayment is called a refund offset. Refund offsets to child support, TOP debts, State income tax obligations, and Unemployment Compensation debts are handled by the Treasury’s Bureau of the Fiscal Service, formerly Financial Management Service (FMS), through the Treasury Offset Program. This occurs after a refund is certified by Internal Revenue Service (IRS) for payment by Bureau of the Fiscal Service, but before the refund check is issued. All taxpayer refunds may be subject to offset. Effective January 2016, the Department of the Treasury, Bureau of the Fiscal Service (BFS), is amending its regulation governing the offset of tax refund payments to collect certain past-due child support obligations. This rule will limit the time during which Treasury may recover certain tax refund offset collections from States, when the States have already forwarded such funds to custodial parents as required or as authorized by applicable laws. This change will limit the time during which Treasury may require States to return the offset funds to six months from the date of such collection. The six-month limitation period, noted in (4) above, does not apply to the processing of Form 8379, Injured Spouse Allocation. Continue to process injured spouse cases as always. Internal Revenue Code IRC §6402 (a), (c), (d) and (e) require a taxpayer’s overpayment to be applied to any outstanding federal tax, non-tax child support, federal agency non-tax debt, state income tax obligation or certain unemployment compensation debts prior to crediting the overpayment to a future tax or making a refund. This application of a tax overpayment is called a refund offset. Refund offsets to child support, federal agency non-tax debts, state income tax obligations and unemployment compensation debt are handled by the Bureau of the Fiscal Service (BFS) through the Treasury Offset Program (TOP). This occurs after a refund is certified by Internal Revenue Service (IRS) for payment by BFS, but before the refund check is issued or direct deposit is transferred to the taxpayer’s bank account. What kinds of debts might be offset? The IRS makes offsets for federal taxes. All other offsets are handled by the Treasury Department’s Bureau of the Fiscal Service (BFS), previously known as the Financial Management Service (FMS). For federal tax offsets, you’ll get a notice from the IRS. For all other offsets, the notice will come from BFS. TOP matches people and businesses who owe past-due (delinquent) debts (for example, child support payments) with money that federal agencies are paying (for example, a tax refund). To the extent allowed by law, when a match happens, TOP withholds (offsets) money to pay the delinquent debt. Office of Child Support Enforcement Temporary Assistance to Needy Families (TANF) (payments to the state). Office of Child Support Enforcement Non-TANF (payments to the custodial parent through the state). TOP offsets occur after the IRS has certified a refund to BFS for payment (TC 840/846 on account transcript), but before BFS direct-deposits the refund overpayment or mails the refund check. 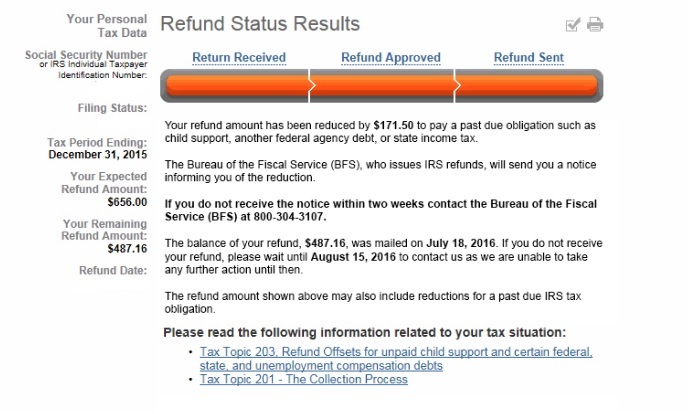 How Can You Find Out if Your Refund Will Be Offset? The federal Bureau of the Fiscal Service (BFS), part of the Department of the Treasury, issues refunds and tracks offsets. Call the Bureau of the Fiscal Service directly at this toll-free number: (800) 304-3107. Listen to the prerecorded message and do as instructed. Do not call on someone else’s behalf, as this is a violation of federal law. The call center records callers’ phone numbers. Enter your social security number when prompted. The BFS will search its database to see if there is an offset against your debt. Write down any information provided, including the creditor agency that created the offset, so that you can call with any additional questions. New debts are added to the database daily, so if the recording says no offsets were found, you may want to check again in a few days. If you don’t believe you owe the IRS any tax, call the IRS toll-free at 1-800-829-1040 (or TTY/TDD 1-800-829-4059) for more information or assistance in resolving the debt. You will receive a notice to let you know that your refund will be offset. The notice may arrive a couple of weeks after the offset is put into the database. The notice will show your original refund amount, your offset amount, the agency that the offset was paid to, and its address and telephone number. If the offset is from the BFS, BUT the refund amount on the BFS offset notice is different than the amount on your tax return, you should contact the IRS to resolve the discrepancy. If you believe you don’t owe a debt to another agency or have questions about it, contact the agency that received your money as indicated in your notice. 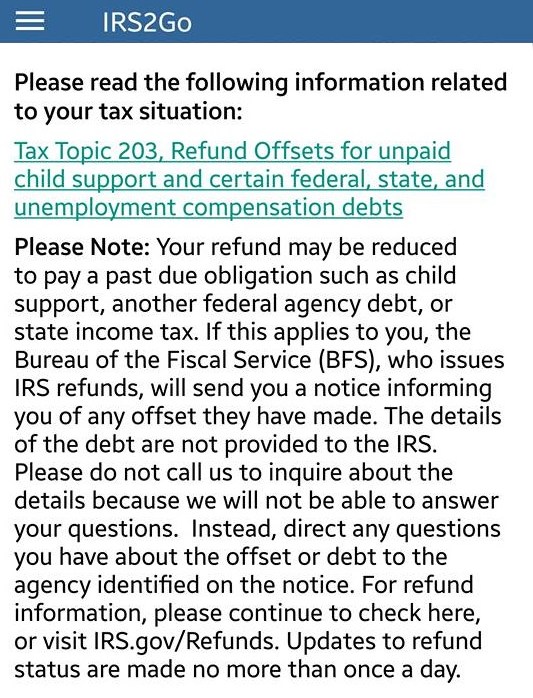 If you didn’t get a notice about an offset but your refund is smaller than you expected, call the IRS toll-free at 1-800-829-1040 (or TTY/TDD 1-800-829-4059). If you filed a joint tax return, you may be entitled to part or all of the refund offset if your spouse is solely responsible for the debt. To request your part of the refund, file IRS Form 8379, Injured Spouse Allocation. If your refund was offset to pay a joint federal tax debt and you believe only your spouse or former spouse should be held responsible for all or part of the tax, you should request relief from the liability. To request relief, file IRS Form 8857, Request for Innocent Spouse Relief. The instructions for this form have helpful directions. The IRS will use the information you provide, and any additional documents you submit, to determine if you’re eligible for relief. Is your tax problem more complex? If your issue is causing you financial hardship, you have tried repeatedly and are not receiving a response from the IRS, or you feel your taxpayer rights are being violated, consider contacting TAS. Do you feel that you need help from a tax professional but can’t afford one? You may be eligible for representation from an attorney, certified public accountant (CPA), or enrolled agent associated with a Low Income Taxpayer Clinic.